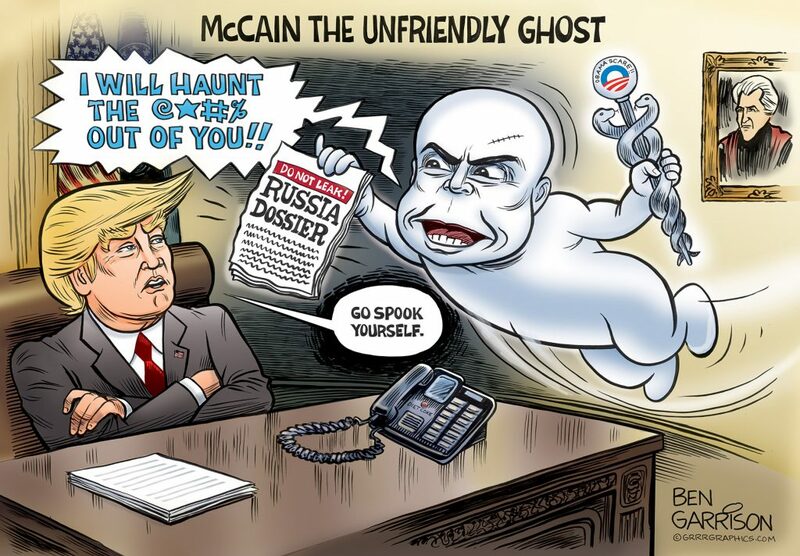 “McCain, the unfriendly ghost, the most traitorous ghost we know, the Deep State all loves him so. The late senator, John McCain, keeps haunting Trump from the grave. Trump has never liked McCain and isn’t shy about telling people why. All the money spent by the investigator would have helped those that truly need a hand up. Not a hand out. Anything his daughter says is because he was her Dad and she should defend. We all look past family vaults. But, McCain was a perfect example of people of privilege getting ahead because of family, not on his merit. McCain was a horrible man who made a career our of crashing planes. He was a notorious alcoholic philanderer who openly boasted of his sexual conquests. The only reason he got into Annapolis at all was because of his father and grandfather. He was very dumb at Annapolis and thereafter. The thumbs down vote was a disgrace. immeasurable lasting damage to our entire political system and social values.